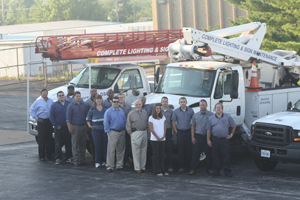 Green Business Case Study: Lighting Service, Inc.
Energy efficiency is a thriving percentage of this business, founded in Overland, Missouri in 1946. Current owner George Irwin leverages his staff’s bi-state electrical contractor licensing and local utility Trade Ally registration to provide customers—including many small businesses—with energy product market-savvy, energy efficiency expertise, and skilled electrical contracting and sign maintenance. A business investing in this company’s services can see paybacks quickly exceed service costs. Maintaining registration as an Ameren Trade Ally (in both Missouri and Illinois) enables Lighting Service to calculate energy efficiency project customers’ actual savings, report this data to the utility company, and secure incentives (based on actual projected power demand reductions) to reduce customer costs to implement efficiency measures. A triple-net lease requires Lighting Service to pay utility bills for their tenant space, but this measure, in turn, allows the company to realize savings from their own energy upgrades. Their long-term leasing preference supports periodic efficiency investments, especially as lighting products evolve and it’s continually advantageous to test new products in-house. Educating customers that using less energy means less maintenance (changing light bulbs, maintaining HVAC equipment)—which equates to additional cost-savings from efficiency. Working with any size business, from a single-site local enterprise to local facilities of national chains, to upgrade energy efficiency, intentionally or in the context of maintenance work. Staying continually abreast of lighting product improvements, to pass knowledge and savings along to customers. Integrate efficiency measures with all their own building updates. Work with a utility Trade Ally to gain access to local utility incentives, even when energy efficiency incentives are not being offered in a public distribution cycle. Member of the Overland Business Association.